For more than 4,000 years the Chinese have cultivated a system of medicine deeply rooted in holistic principles. Chinese medicine is based on the concept of Qi and in the theory of Yin and Yang. Acupuncture is one of many modalities used in Chinese medicine to achieve health and restore balance to the body. 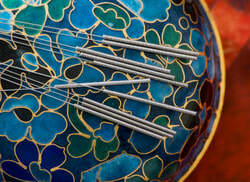 Acupuncture can be used to treat virtually all medical conditions. It is often combined with other healing modalities to achieve optimal results. Schedule a free, no-obligation consultation and find out if Chinese medicine can help you with your health concerns. Acupuncture is the gentle and painless insertion of a sterilized acupuncture needle into points along meridians or energy channels in the body. The goal is to increase the flow of Qi and blood through out the body; balance the Yin and Yang forces; and restore balance and harmony. This is one of the most commonly asked questions. such as sciatica, low back pain, stiff neck and shoulders, fibromyalgia, arthritis, tendonitis, carpal tunnel syndrome, plantar fasciitis, and other chronic pain conditions. such as tension headaches, migraines, depression, anxiety, insomnia, chronic fatigue syndrome, and substance abuse. such as PMS, infertility (men included), irregular cycles, painful periods, hormone imbalances, PCOS, endometriosis, menopause, and weight gain. such as weight gain, acid reflux, bloating, gas, hemorrhoids, Crohn's disease, constipation, and irritable bowel syndrome. such as hypothyroidism, hyperthyroidism, diabetes, adrenal fatigue, and hypoglycemia. such as high blood pressure, hyperlipidemia, palpitations, and poor circulation. Your first acupuncture treatment at Bodyscapes will run approximately 45-60 minutes. Treatment occurs in a quiet, private room on a comfortable massage table. A heated table pad and an infrared TDP heat lamp may be used to keep your body warm. Soothing music and soft lighting are used to create a relaxing atmosphere. Depending on your individualized treatment plan, your session may involve massage therapy, gentle acupuncture, accessory techniques such as moxibustion, guasha, cupping, electrical stimulation, hot or cold packs, and aromatherapy. You will want to wear loose, comfortable clothing to your appointment and eat lightly before you arrive. Give yourself ample time for your appointment so you don't have to rush. You want to enjoy and savor every minute of your treatment.